If Kuhn Rikon is known as the Mercedes of pressure cookers, then WMF is the BMW- in a class of its own with emphasis on quality, usability and durability. 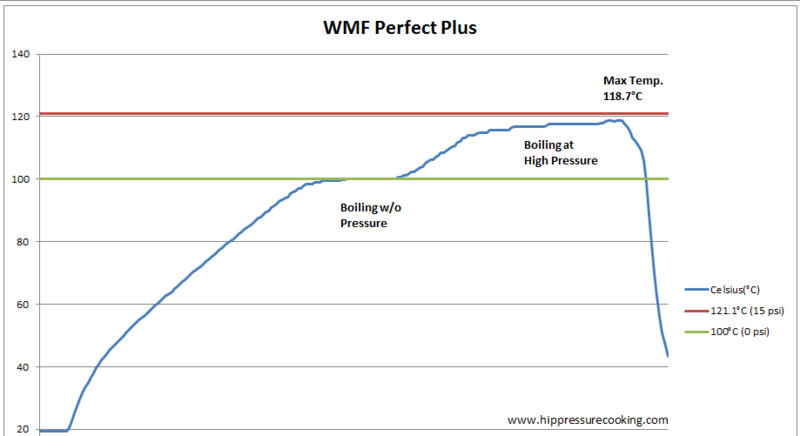 The WMF Perfect Plus pressure cooker has a couple of features that are brilliant – like a sound to let you know it’s gone into over-pressure and a completely new way to release it (see “Innovative Pressure Release” in the Performance section). We were a little apprehensive about reviewing the WMF, after our experience with another premium cooker. We were convinced that innovation and sophistication comes at the cost of durability and consistency but, thankfully, the WMF Perfect Plus proved us wrong. In America, WMF pressure cookers are commonly, and inaccurately, referred to as the “13psi cooker” – with a caveat that it’s 2 psi less powerful than “15 psi” cookers. If this were true, this large difference in operating pressure would require the cook to make adjustments to the cooking times from recipes written for “15psi” cookers by a minute or two – depending on the food. Most pressure cookers that say they operate at “15 psi” actually cook at 14.5 psi (the number is rounded up). WMF pressure cookers actually operate at 13.8 psi . The true difference in operating pressure between the two is less than a point, not two, making any adjustments to cooking times come down to seconds not minutes – in other words, negligible. The WMF Perfect Plus gets a very small ding from us in this category because the handle on the lid not self-locking like so many of it’s modern peers. This means that once the lid is in place, the cook needs to remember to slide the handle lock closed. All-in One Removable handle and valve mechanism – The handle, and pressure valve are encased in a single unit. It can be easily removed for cleaning with the move of a button. The handle clicks back into the correct position by hooking onto the metal handle guide on the lid. In-handle pressure release – Ensures the cook not come in contact with the super-heated lid or sides of the cooker to release pressure. The whole operation can be done near the tip of the long handle keeping fingers, wrists and fore-arms of the absent-minded cook safe. Over-pressure Alert Sound – When the cooker has reached pressure but cook has forgotten to turn down the heat, a harmonic tooting sound will begin to play softly to alert the cook to lower the heat to and begin timing their pressure cooking. Should the cook not move quickly enough to do this the sound will crescendo into a more urgent loud toot. Fill Lines – Capacity marks inside the pot indicate 1/3 full (we don’t know why), 1/2 full (maximum for cooking grains, beans and other foamy foods) and 2/3 full (maximum for regular pressure cooking). The WMF Perfect Plus has the standard set of redundant safety features, comparable to its peers. Instead of a locking lid, it has an Automatic Release Handle, which forces the cooker to release pressure when the cook attempts to unlock and open the cooker. Automatic Release Handle – The pressure cooker cannot be opened without releasing pressure. Moving the handle slide (aka pressure release) to the “open” position forces a pressure release ensuring the cooker cannot be opened while the contents are under pressure. Primary over-pressure release valve – Integrated in the pressure signal, activates to release pressure if the pressure cooker reaches 16 PSI it begins to release excess pressure and make a “tooting sound”. Secondary safety valve – Located across the lid from the primary pressure valve, a small silicone plug that activates in case the primary should be obstructed or not working properly to release pressure. Safety Gasket vent – The safety vent is a cut-out on the lid and comes into action in case any of the previous safety measures were to fail. The gasket will buckle and allow pressure (and some of the contents of the pressure cooker) down the sides of the pressure cooker. The cook should always point this cut-out in the rim away from him while operating the pressure cooker. We were fascinated by the silicone plug in the lid- ‘cmon, it looks like the little button-nose of a puppy! On closer inspection, and discussion with WMF, we discovered that it’s more than just a cute safety mechanism (see section above) but plays an integral role of assisting the pressure cooker to build and release pressure. This silicone plug contains a little metal ball that is pushed from one chamber to the other to vent, maintain or release pressure. The WMF Perfect plus pressure regulator is integrated right in the pressure cooker handle. The indicator bar communicates what is happening inside the cooker. It’s the blue circle nested in the part of the handle that covers the lid of the pressure cooker. When the cooker is in use, the indicator rises out of its housing to display a brightly colored cylinder with a series of rings. When the circle is level in the the handle, it means that there is no pressure in the cooker. The first ring, in yellow, informs the cook that pressure is building. A secondary lock inside the handle clicks closed in the cooker assuring that the lid cannot be opened by accident. The next ring, in orange, signifies that “low pressure” has been reached. The last ring, also in orange, means that “high pressure” has been reached. The advantage of an indicator bar vs. a pressure selector, is that the cook can turn the heat down while the bar is in any position to maintain that pressure. For example, anywhere between the first or second ring for “Medium Pressure” or just after the yellow ring for “Extra Low” pressure. Should the cook have their back turned or have stepped away while the cooker is building pressure, once the signal raises past the second ring and goes into over-pressure it begins to make a soft harmonic tooting sound, which gradually becomes more persistent until the cook realizes that the heat must be turned down. This sound is loud enough that it can be heard outside the house and into the street (just ask our neighbors!) It quickly snaps the cook into action. A common complaint of modern pressure cookers is that they are either too quiet – and stealthily vent out all the cooking liquid while the cook isn’t looking- or too complicated – with detachable timers that work in a non-standard proprietary way. We can assure you that this cooker has neither of those problems! While the WMF needed just a tad more heat than the Kuhn Rikon to maintain pressure (knob position 1.7 vs. 1.6), it was a little difficult to gauge the evaporation rate. On the first test the WMF preformed terribly (but that’s because we waited until it started to toot). Subsequent tests, where we turned down the heat just-after we saw the second ring but before it tooted were inconsistent enough that we had to test this cooker six times instead of the usual three (one test was an eye-brow raising 1.5% evaporation, while another was nearly 5%). Overall, the average evaporation is comparable to its peers. Our test recipes like a risotto, tomato sauce, potatoes, beans and dessert all turned out perfectly. The way this cooker releases pressure is brilliant. Careful cooks release pressure from their cookers with tongs, wooden spoons, spatulas, oven mitts or whatever is at hand to extend their reach over the super-heated lid of the cooker to press a button or switch a liver to trigger a pressure release while keeping their fingers out of the way of escaping vapor. None of this additional protection is necessary when it’s time to release pressure from the WMF Perfect Plus because the pressure release lever is near the tip of the long handle – away from the hot lid or spray of vapor. The cook can regulate how quickly to release pressure by the position of the release slide. Pull the slide forward just a tad and walk away to do something else and the cooker releases pressure slowly and delicately all by itself. Pull it forward all the way to the end, and pressure will be released quickly (30-60 seconds, depending on the fill level). The pressure release slider can be positioned anywhere in-between these positions for slow-medium, medium, and medium-fast releases. Controlling the speed of pressure release is a major improvement from pressure cookers that release pressure with a trigger – which is basically an on/off switch. The only way to regulate the speed of a trigger release is by pulsing quick bursts of pressure – each burst violently boils the contents of the cooker – not very delicate. Snap on! Click. Click. Snap off! Click. Click. Snap on, snap off.. the snapper! The WMF Perfect Plus handle has one last trick. It can removed quickly with the push of a button and easily snapped into place. Unlike other cookers with removable handles, that need to be tightened before each use, this cooker’s handle hooks onto the lid and snaps into the right position on the first try and does not dislodge during use or storage. The top and bottom halves of the long handle on the cooker are mounted very near each other in that the plastic of the top and bottom handle touch each other when twisted together. On several occasions we’ve had difficulty opening this cooker and the accompanying pressure pan that came as part of a set. When the handles stick they really stick and need husband-strength twist to pull them apart and serve dinner. WMF could not give us any more information about this problem because neither their customer service in the US nor the product management in Germany has heard of it. We could not ding their score due to the a problem only our model has experienced. However, if you have this cooker, please leave a comment below to let us know whether you have or have not experienced tightness in the handles. There’s another kind of tight fit that does ding WMF’s score in this category. The cooking surface at the base of the cooker is only 7.6 inches wide (19.5 cm diameter) – this is the same width and surface area we didn’t like in the Fissler Vitavit and we still don’t like it WMF. The WMF Perfect Plus is dishwasher safe! It gets a perfect score from us in this category. It’s so easy to dismantle, clean up and put this cooker back together we wonder why no one else is doing it. The handle only needs to be run under hot water for clean-up- even after a particularly messy meal a quick rinse is all that was needed. Sold separately are a trivet and steamer basket (which we have not seen). And a glass lid that came with the pressure cooker set we received. The glass lid is fantastic. It’s heavy -which is what you want in a lid- and the glass is so thick it could probably stop a bullet. Our average run-of-the-mill glass lid weighs 14.5 ounces (416 g) while the WMF glass lid weighs 22.8 ounces (649g)! The handle is also mounted tightly onto the glass so when its run through the dish-washer liquid doesn’t pool between the two. We don’t score for this but it’s worth noting that the instruction manual is not very good. Although the manual for the American WMF’s contains twelve Lorna Sass recipes it’s devoid of any technical information about the cooker. All of the specifications on the cooker’s pressure at high and low pressure were removed. We had to refer to the UK version of the user manual – for this information. Both British and American manuals have one short paragraph each on canning, juicing and sterilizing but no practical or detailed information on how to actually do those things with the cooker. They also fail to list the features and, more importantly, detail the safety mechanisms – we had to email the manufacturer to get this information. We started this review with by busting the myth of the WMF Perfect Plus is “13 psi cooker” – it should be more accurately called “14 psi cooker” making it nearly as powerful as its European peers (which only reach 14.5 psi). When our readers are shopping for cookers, or meet Laura Pazzaglia at a cooking demo, the question we receive most frequently is if premium cookers are worth the price. The answer is always the same: All pressure cookers pressure cook. With pressure cookers, you really do get what you pay for. The higher the price, the easier they are to use and heftier the materials. Premium cookers offer special little features that you didn’t think you ever needed (but can’t live without once they’re experienced). The WMF Perfect Plus offers an auditory over-pressure alert, in-handle pressure release, and easy snap on/snap off handle (cleaning this cooker is literally a snap). Tight handles, small cooking surface and forcing the cook to remember to lock the lid (while so many other cookers are self-locking) are things we hope WMF will address in future models. NOTE: This review was fact-checked by the Director of Marketing and Category Management from WMF USA prior to publication. In the interest of full disclosure, we would like to note that:The pressure cooker was sent to Hip Pressure Cooking by the manufacturer at no cost. Our relationship with the manufacturer, or lack thereof, does not affect the outcome of the review. Thank Laura so much for your consideration for my issue. I will try it with my cooker. Hopefully it will be ok and I will tell you about that. One thing struck me very hard upon reading this review. You did not take out points on safety grounds for steam realising horizontally rather than upright. But in the review of Fissler cooker you criticised that big time. The steam realises in a very same direction in case of WMF and Fissler. It was a hazard to keep the handle towards the cook in case of Fissler. But is it ok in case WMF. Not being mean or anything. Do not understand me wrong. But I don’t thinking your judgement was fair. I can’t agree with it at all. You may have comparison of many cookers done by very same person. But if one of the cookers was faulty or damaged. Or seemed to be of poor assembly or quality. You would score it low. But it could be very one of a batch. It is in the interest of the company to provide you with the best sample. But I don’t think they open factory box to check if everything is perfect before shipping to you. Now when checking scores on online shop. Clearly out of hundreds reviews one can distinguish good or a bad product. As I do appreciate your reviews. I would not think they could not be manipulated. Especially that very same website runs a shop. I do not intend to offend you. Just expressing my own view on this. I’m not offended at all, I welcome the opportunity to clarify my criticisms of Fissler vs WMF. The problem with the Fissler release is not that it’s horizontal (Magefesa and Fagor Chef also release pressure horizontally and I did not have a problem with that). The Fissler I reviewed shoots steam in THREE different horizontal directions and there is just no way to point the cooker in a way that will not possibly harm someone else standing in the same kitchen. I have over 10 Fissler pressure cookers, different sizes and models, and my opinion on the durability of this cooker is based on my use of these cookers over at least a couple of years (before writing the review of their latest model). Nothing represents my opinion of these cookers more than the fact that they are ALL still sitting in my storage shed (click on the photo to see the full panoramic). I have not given Fisslers away to friends or family like the Fagors and Maghefesa’s that I tested. I didn’t ask Fissler to send me another sample because by that point I was fed up with continually getting replacement valves that didn’t work out of the box. They should be testing the quality, not me, not the consumer. I’m really sorry that things didn’t go well with them – they make a very high quality body but everything else about their pressure cookers, including the management of replacement parts, is a total disaster. And here are the other ones.. Thanks very much for clarification Laura. I appreciate your time. Just bought the perfect WMF and love it. The only difference between the perfect and the perfect plus in the handle. The perfect plus in the newer model…. I did have trouble opening the handle and went back to the store where I bought it. She showed me and it is a little trick – you have to push it down and push it in – now it works like a charm. Love it…. and thank you for the review…. I love my WMF Perfect but I have had a problem opening it on a Very Few occasions . The Best Pressure Cooker ever. My WMF always sticks: I simply cannot get it open by myself, even if I wait until the entire pot is room temperature. My husband can force it open, but he has huge hands and very big forearms. And the plastic handle flexes as if it’s going to break before it gives way. It’s a great pot for many things, but not for pressure cooking. Alas. If “Nancy” can be more specific about the trick she learned, I’d be grateful. I am very interested in WMF for my travel trailer (as well as a stovetop alternative to my IP). BUT …. reviews on Amazon & comments above suggest widespread problems opening the pressure cooker. LAURA, have you tried Nancy’s solution (10/16/16)? Have you spoken with the manufacturer recently? Has the manufacturer resolved this issue (or at least acknowledged this problem)? Also, a Amazon reviewer suggested the handles must be thoroughly cleaned after each use to avoid problem. Any info you can provide is impotent to me. I’m not prepared to purchase something I’ll need a strong man on hand to open. That’s a shame as you gave this product such a strong review. I have been using my Perfect Plus at least once a week for about 12 years, daily in winter. If the lid appears to be stuck, close the pressure release, press the pressure regulator fully down, slide the pressure release open again, and it opens perfectly. Jane, I own 4 of them and gave a fifth to my mother. I have had none of the issues you referenced and recommend these highly. I saw this owning Kuhn Rikon and some other lesser brands. Clean up on these is easiest out of all the brands I have personally used. I should note that I exclusively hand wash mine so, this may account for some small differences. As for cleaning the handles, that really isn’t a problem for me even when I get them super messy with a pot of beans filled too full. Hot soapy water and a brief soak and scrub restores them to pristine condition easily. There are also a lot fewer nooks and crannies to collect debris than with my Kuhn Rikon pressure cookers. Sid, I decided to get a Magefesa Perfecto 3.2 Liter. It’s more economical than the Perfect Plus and (per Laura’s review) extremely well built. I got it about a month ago & I am working through the idiosyncrasies of this PC. It exactly meets my needs. I have to say that the Instant Pot is so much easier to use. But I don’t have the counter/storage space for a second, 3 Qt IP. Plus, I need something when dry camping in my Travel Trailer. This has already become a versatile addition to my cookware. Jane, I’m glad it is working out well for you. Magefesa is a well respected brand among several so I’m sure it will serve you well for years to come. All of the pressure cookers have their own little idiosyncrasies so, a lot of what makes one preferable to another are often personal preferences with a few tangible differences that may irk some people and not others. Settling on a stovetop took a bit more time, and I really appreciate your input. I’ve been using the Magefesa lot the past several weeks and am getting very comfortable with it. I just stored it in my travel trailer and am looking foreword to taking it on the road. Of course because I’ll be using a “new” stove, I’ll be starting from square 1: the water test. I must say that working with a stovetop has left me with a deeper appreciation of the Instant Pot. It really is so much easier to use, and it allows me to leave the house. But I wanted something smaller that I could use at home in conjunction with my IP, and while camping in my travel trailer. And so far, I am very happy with my decision. Thanks again for your input & good wishes. I bought my Perfect Plus 7 years ago and I use it every single day. Especially since my twins were born almost 6 years ago. I cook a lot of casseroles for them with meat/chicken etc with lots of vegetables and pulses and most meat is cooked within 20 minutes and melts in your mouth. I love this pressure cooker so very much…At our holiday home in Turkey I have a Tefal one and they’re miles apart in terms of ease of use and efficiency…in 7 years, I’ve changed the seal twice and the secondary safety valve once..Mine does lock occasionally but I wouldn’t say it happens all the time. My only criticism would be the secondary safety valve (3); sometimes the pressure indicator doesn’t pop up and the steam is released through the secondary safety valve so I’d either have to give the pot a bit of a shake or open the lid and push the little ball a bit to get it working….This is my only problem with this superb pressure cooker.